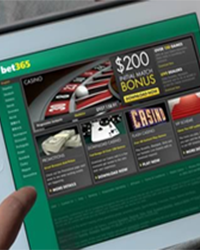 That’s right – I joined an online gambling site recently and the results might surprise you. The next thing I knew I was involved in a structured communication program that involved personal phonecalls to my mobile, special promotions, competitions and I didn’t even have to leave my lounge chair. That’s not even the best part. A personal experience of mine confirms the battle ahead for the industry. I Recently joined an online gambling site, (something that has yet to pass Australian legislation) and within minutes, I had $150 worth of play, my favourite spot on the lounge, a flat screen television streaming my pokies game from my iPad and all from a $50 deposit. It was so easy and it was all in the comfort of my own home. What was even more astonishing was that I was offered a deal where any deposit would be doubled. For example, if I deposited $50 on their site, it would be double to $100. Not only that, if I were to deposit $50 or more, I would be entered into the draw to win a trip for two to Hollywood. Within two minutes of laying down my deposit via credit card, I had $150 to play with. To top this off, the very next day I received another phone call congratulating me on my deposit and was asked if I enjoyed my experience! It’s an undisputed fact that the online world has changed the way we do business. A recent report by Junipers predicts that mobile sports, casino and poker betting will generate $100 billion annually by 2017. With internet speeds getting faster and more efficient, 5G networks will provide consumers with lightning access to a huge variety of online gambling, and the NBN will only increase this paradigm. However, land-based gambling will always have a part in our industry purely based around ‘Entertainment’. If you were to look back and learn from the past, what would you do differently? Could you somehow transfer the knowledge and trends into an imaginable future outlook? What we have learnt is that technology and government control has a large influence, but is not the be all and end all. In my business, I am lucky to have the opportunity to visit varied venues across the world from pubs and clubs in Australia to Casinos in Macau, Singapore, California, not forgetting Las Vegas. Currently, myself and other colleagues from DWS are undertaking an extensive study into Ticket in, Ticket out (TITO) and Card Based gaming. Part of this research involves visiting a number of high profile clubs in New South Wales as well as collating data from studies by United States research authorities with the intent to establish, not only the benefits to the venue, but the impact on the player. TITO has been around in various forms for a large number of years, initially incepted as TO (Ticket out). However, the question is – will this technology be surpassed over time, or will it create an experience for the player by improving ease of movement around the venue? Alternatively, Card Based Gaming may be an equally effective solution. There are many questions that must be answered and learning from other jurisdictions is a key strategy in making this process more cost effective and productive. Ensuring player comfort is a substantial part of our business. The moment we confuse the patron or make it difficult is the time they may consider frequenting another venue. Consistent, effective communication plays a large role in cracking this nut – but what if a business can do all this without the costly overheads of a physical venue? As scary as this new technological environment might seem, it isn’t all doom and gloom. As industry professionals, we should see this as challenge for us to create a better entertainment experience to draw the customer into our venue. Our research has shown that many areas that must be addressed, including technology that can be used to enhance the players’ experience. DWS can provide you with various strategies to deliver a first class product, ensuring all key areas are evaluated, if you intend to remain competitive in the market you must stay ahead of the game. Call DWS on 3878 9355 or contact me on danny.ns@dws.net.au for an independent review.